Marabella by Gorham, Stainless Tablespoon, Pierced (Serving Spoon), Active Pattern: No, Circa: 2004, Size: 8-1/2", Used for dishing vegetables, fruits, or casseroles which are served in their own juices. Marabella by Gorham, Stainless Cold Meat Fork, Active Pattern: No, Circa: 2004, Size: 8-5/8", Used as a serving piece on meat platters. 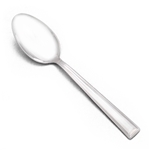 Marabella by Gorham, Stainless Tablespoon (Serving Spoon), Active Pattern: No, Circa: 2004, Size: 8-1/2", Used for serving vegetables, fruits, or casseroles.